Expires 11/17 - Experience Extreme Energy, Enhanced Focus & Powerful Sensory! Expires 11/17 - Experience Extreme Energy, Enhanced Focus & Powerful Sensory!Expires 11/17 - Experience Extreme Energy, Enhanced Focus & Powerful Sensory! Scientifically Tested for Effective Weight Loss! Featuring Pu-erh Tea & BioPerine! 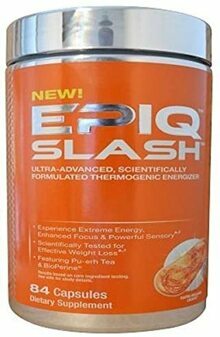 EPIQ SLASH is the most extreme thermogenic formula we’ve ever launched! It delivers an energy-boosting, focus-enhancing thermogenic overload, plus a key weight loss driver and BioPerine. This never-before-seen combination of a precise standardization of yohimbe, ancient pu-erh tea extract and skullcap (Scutellaria) work to deliver a new, potent and clean sensory experience. Yohimbe Bark Extract: Supplying a highly potent dose of the active compounds yohimbine and rauwolscine. Pu-erh Tea Extract: Works together with other ingredients to support potent sensory experience. Skullcap Herb: An herb native to Asia that contains baicalin (a flavonoid), which contributes to the extreme sensory experience. C. canephora robusta: 2Subjects taking 200mg premium C. canephora robusta found in EPIQ SLASH lost an average of 10.95 lbs. in 60 days with a low-calorie diet, and 3.7 lbs. in 8 weeks with a calorie-reduced diet and moderate exercise. 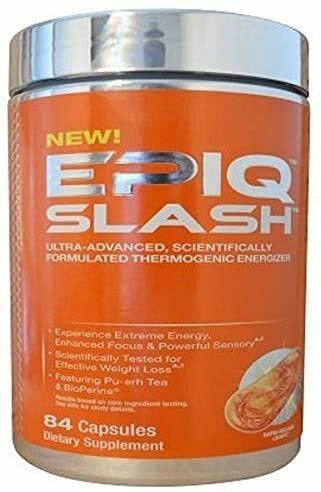 Garcinia Cambogia: EPIQ SLASH also delivers Garcinia cambogia supplying 70% hydroxycitric acid, and that’s one of the highest standardizations on the market today. Caffeine Anhydrous: Scientifically researched ingredient shown to enhance thermogenesis, increase energy and enhance mental focus.